Benchtop planers are only for professionals. They cost too much. You really don’t need to buy a portable benchtop planer. As a novice or experienced woodworker, I’m sure you’ve heard similar statements all the time. We’ll I’m here to tell you that none of this is true. Benchtop planers are a great option for both professional and non-professional woodworking. They don’t all cost thousands of dollars and a portable planer is just as helpful as a stationary benchtop planer. The only thing that matters is that you purchase the best wood planer of 2019 that supports your woodworking needs. For our loyal DIY-ers and professional carpenters, we’ve collected and reviewed the top selling planers currently on the market. We’ve found the best cheap and inexpensive planers that work like they’re selling for thousands of dollars. Whether you’re designing a cabinet or woodworking a simple DIY project, these planers will help you accomplish your woodworking goals. Go ahead and take a look at what we’ve found. Before we begin our review of our top rated wood planers, why don’t you take a look at our in-depth comparison table? We compared each machine based on its weight, size, power source, voltage, and warranty. These factors helped to determine which benchtop planer would be best to buy depending on the need. So, go ahead and take a look at our list of the top 18 wood planers of 2019. We compared our top woodworking machines based on their dimensions and weight. This helps to determine how portable they are and how much surface space they may take up. We added the voltage and power source to provide a better idea of how they performed and rather or not they required an outlet. Finally, we compared based on additional equipment and warranty to show what also comes included with the package. Some of our choices came with complementary knives and wrenches. Quite a few featured a money back guarantee or product warranty that protected against defects in materials and workmanship. These help you save money in the long run and provide a much better deal. The DEWALT DW680K Planer features an impressive 7.0 amp motor that’s capable of performing up to 15,000 RPM. It comes with a handy calibrated depth adjustment knob for accurately determining the depth of the machine with each use. This planer offers a maximum cut of 3/32-inches for shorter uses and fewer passes. It accepts both high-speed steel and reversible carbide blades for versatility. Its handy kickstand is incredibly helpful for intended use with equally great results. The poly-v drive belt is designed for low care and maintenance but guaranteed extended longevity. 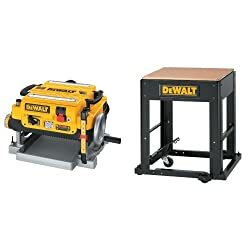 The DEWALT DW680K Planer comes with a wide assortment of materials, such as 2 reversible carbide blades, a handy carrying case, and a rabbeting fence. Not only that, it also comes with an edge guide and a metal box for holding additional pieces and equipment. 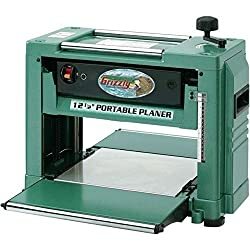 This planer portable wood planer is an all-in-1 product that’s guaranteed to provide quick level results with every use. 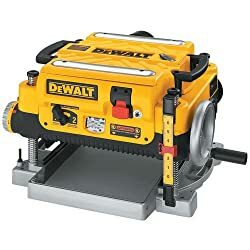 The DEWALT DW680K Planer could improve the location of its exhaust port. It’s currently located on the back of the wood planer, near your face. Sometimes when you’re using this planer, you forget that the exhaust is on its back. When you’re least expecting it, a burst of wood chipping may be blown in your face. So, I suppose just stay aware and cautious when using this planer. The DEWALT DW680K Planer features a corded-electric design for both simple and commercial level work working. It’s best if used on a solid, level surface. It also comes with a 3-year warranty that protects against product defects in materials and workmanship. At 6.2 pounds, this wood planer is also portable. So, if you’re looking for a powerful portable wood planer, then you might want to give this product a closer look. While the DEWALT DW680K Planer is a powerful product, it lacks additional features that make it easier to use. The Makita 1002BA Curved Base Planer continuous our list with an extremely powerful 11 amp motor. Unsurprisingly, it’s capable of performing up to 15,000RPM, effortlessly. Designed with an interesting precision machined base, it can cut up to 12 5/8” per curved radius. It comes equipped with an extra-large ejection chute for spitting out large wood chips. This curved base planer also features a convenient duo-grip design for better control and comfort while cutting. Despite its powerful motor, the Makita 1002BA Curved Base Planer is incredibly easy to maneuver and control. This may be due to its lightweight design. It also features a lock-on button for simple and hassle-free continuous use. This product comes with a sharpening holder, a socket wrench, high-speed steel, a blade set, and a blade gauge. It’s an all-inclusive kit for both professional and novice carpenters. 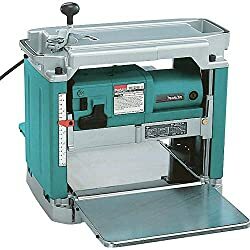 It’s important to note that the Makita 1002BA Curved Base Planer is, by no means, cheap. In fact, it might be the most expensive product on our list. 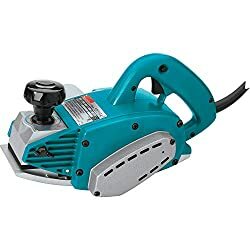 That said, it’s still a fairly new base planer and you may be able to purchase it for cheaper prices off of Amazon or another website. The Makita 1002BA Curved Base Planer is the best option for those planning on creating arched and curved pieces. At 4 pounds, it’s lightweight and easy to control. It perfectly smooth’s notches and dents for a clean, elegant fit. Also, this product comes with a 1-year warranty that protects against product defects in materials and workmanship. While it might not hold up to the heavier, more industrial side of woodworking and carpentry, it’s perfect for detail work. In terms of detail work, the Makita 1002BA outshines most of the planers on our list. It’s too bad that it’s not built for more industrial-level work. The Makita KP0800K Planer Kit comes next on our list with its 6.5 amp motor and 17,000 RPM average. It features a duo-blade cutting head for quick, smooth slicing through even the hardest of woods. Its quick and simple blade setting system makes switching out the blades an easy process. This planer also features a precision machined aluminum base for better, more level results. It’s capable of performing up to 3 ¼” wide cuts with a 3/32” depth. Not only that, but its click depth adjustment knob saves you plenty of time while adjusting the machine. Like all Makita products, the Makita KP0800K Planer Kit was designed for both casual and heavy-industrial woodworking. It features a handy lock-on button for continuous, effort-free usage. This product comes with a few extra accessories, such as a wrench, blade set, a guide rule, and carrying case. Albeit a bit expensive, this product promises smooth and defect free-results. In terms of price, it’s definitely worth every cent. The frustrating thing about the Makita KP0800K Planer is that the dust collection parts are sold separately. This means that you’ll have to purchase the bag and adapter after purchasing the planer. It’s frustrating hassle to have to go out and search for the right adapter, as well as the bag. And the bag sometimes costs as much as $50 to $60. The Makita KP0800K Planer Kit features a corded-electric design for continuous heavy-duty use. Despite this, it’s only 9.8 pounds, making it one of the lighter woodworking planers on our list. Just in case you have your doubts about this product; it also comes with a 1-year warranty. This protects against product defects in materials and workmanship. 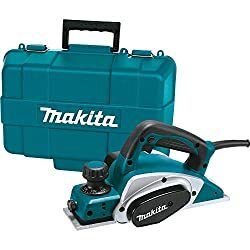 Makita may also offer a 30-day money back guarantee with this planer but you may want to double check this with the manufacturer. It’s unfortunate that the dust bag and adapter are so expensive and are sold separately. However, the Makita KP0800K still performs like an industrial-quality planer. The Bosch PL2632K Planer features a 6.5 amp motor that performs roughly 16,500 RPM. It offers super-fast stock removing with a near perfect finish with every use. This planer comes with an extra-helpful lock-off and lock-on button. The lock-off button helps to prevent sudden or accidental starts with the wood planer is not in use. Meanwhile, the lock-on button is great for continuous usage with little extra effort. Both the lock-off and lock-on function are triggered via the same button for convenience. The Bosch PL2632K Planer comes with a handy spring-loaded stand. This is particularly helpful for storing your tools and accessories. It also features a dual-blade system that can convert to hold high-speed blades. Its dual-mount fence works great as an additional non-flexing guidance system. It also helps to prevent unwanted damage or marring to the wood when inserted. Overall, the Bosch PL2632K Planer is an extra-helpful piece of equipment that’s perfect for any busy carpenter. The most common complaint about the Bosch PL2632K Planer is its tendency to accumulate scratches, quickly. This may be because they used aluminum which can scratch easily. Also, the shoe may not be level with the blades, so make sure you adjust the planer when you receive it. The Bosch PL2632K Planer comes with a wide assortment of additional equipment and accessories. While it doesn’t provide a warranty or a money back guarantee, you are given a wrench, a dual-mount fence, and a carrying case. You’re also provided with a variety of complementary blades, 2 no-mar overshoes, and a shaving bag for the debris. It’s safe to say that this planer comes with the best equipment kit on our list. While the Bosch PL2632K Planer may have some frustrating faults, it still comes with an impressively all-inclusive equipment kit. It’s definitely worth purchasing. The Hitachi P20ST Portable Planer features a 5.5 amp motor making it a bit less powerful than a first few wood planers. Despite this, it’s still capable of performing up to 17,000 RPM. It accepts dual-edge blades, as well as, re-usable blades for convenience and saving money. This product features a max depth of 1/16” and it comes with an adjustable depth knob. Built for mobility and portability, this planer is both compact and lightweight. It offers an ergonomic handle for long usage and comfort. The Hitachi P20ST Portable Planer comes with a built-in dust port for paring with dust bags and other accessories. This is particularly helpful for preventing dust build-up, messes, and accidents in your work area. Finally, this product comes included with a wide array of accessories and attachments. These include a box wrench, a guide, a set gauge, a steel case, and a blade sharpening assembly. If you’re a new or novice carpenter looking for a user-friendly planer, then you might have found it with the Hitachi P20ST. The Hitachi P20ST Portable Planer’s major fault is that it doesn’t come with a dust bag or other dust equipment. This means that you’ll have to purchase it separately after purchasing the planer. Of course, this can be a hassle and it can sometimes end up costing over $50. However, it’s your choice rather or not you would like to purchase a planer that does or doesn’t include a dust bag. 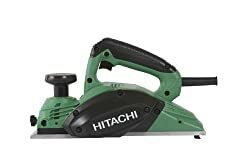 The Hitachi P20ST Portable Planer is a decent product that’s perfect for any new or novice carpenter. That said, what really cemented this product on our list was the 5-year warranty. This warranty covers product defects in materials and workmanship for up to 5 years after your purchase. It’s a good way of guaranteeing that you get what you paid for and more. The Hitachi P20ST Portable Planer lacks the additional features and abilities to really make it stand out our list. However, it’s still a good choice for any novice carpenter. The Delta Power Tools 22-555 13 Planer really impressed us with its 15 amp motor. With this, its manufacturer believes that it’s easily capable of handling the woodworking demands of a small store. That said, it features a sturdy 4 column design for stability and smooth, clean results. Its quick-change blade system offers simple and easy blades changes without having to utilize an alignment jig. It comes with a handy reversible dust port for collecting wood chips from both sides of the planer. 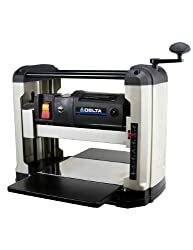 The Delta Power Tools 22-555 13 Planer features dual- polyurethane feed rollers that are positioned near the cutterhead. These are important for guaranteeing that the planer does slip mid-use. It also features a precision machined cutterhead that’s manufactured from steel to guarantee better, more accurate results. Equipped with an overload button, the planer is guaranteed to never overheat or suddenly shut off. The outfeed and infeed tables are manually adjustable for reducing snipe and providing more space for the pieces. There are 2 things wrong with the Delta Power Tools 22-555 13 Planer. The first is its price. While it’s not the most expensive product our list, it definitely can’t be considered affordable. The second is its weight. At 58 pounds, it’s a pretty heavy piece of machinery. Again, it’s not the heaviest planer on our list. However, its weight and price may be something you should take into account before purchasing this wood planer. Unfortunately, the Delta Power Tools 22-555 13 Planer doesn’t come with any extra accessories or attachments. It does, however, come with a 5-year warranty that protects against product defects in materials and workmanship. While it’s not a particularly cost-friendly planer, it is very durable. Made from heavy-duty, long-lasting materials, it’s guaranteed to last years of hard, continuous work. Despite its price and size, we were pretty impressed with the Delta Power Tools 22-555 13 Planer. The DEWALT DW735 Planer comes up next with its 15 amp motor that’s capable of cutting at least 10,000 RPM. This product is probably best for larger and wider materials due to its 1/8” max cut depth and 13” width capacity. It features an extra-long outfeed and infeed table for supporting materials up to 33 ½” long. Its material removal gauge helps to guarantee that each cut is accurate and clean. Designed with a 4 column carriage lock, this planer is built to prevent sliding and material damage while reducing snipe. Of course, because the DEWALT DW735 Planer is designed for cutting larger materials, it’s not typically needed for personal use. It’s a product that’s designed for commercial use. Because of this, it’s heavier and more expensive than most of the planers on our list. Along with that, it can be a bit difficult to find replacement parts for this machine as it’s not ordered very often. Overall, the DEWALT DW735 Planer is extremely powerful and extremely impressive. Along with the chip ejection chute and 3 blade cutterhead, it also comes with a dust hose adapter. It also features a 3-year warranty that protects against product defects in materials and workmanship. Not to mention, it comes with a 90-day money back guarantee. While the DEWALT DW735 Planer is obviously not for everyone, it does a pretty great job for the few who need it. The WEN 6550 Planer comes equipped with a 15 amp motor that’s capable of 18,800 RPM. Featuring an adjustable depth knob, it can cut boards up to 6 inches thick and 12 inches wide. With its sturdy and stable design, it’s guaranteed to provide precise, warp-free results. Unlike most of the other planers on our list, this product utilizes smooth granite to cut wood. Granite is a great alternative that allows the wood to smoothly glide through your planer without marring. It also helps to prevent sawdust and woodchips from clinging to the planer’s frame. The WEN 6550 Planer comes with extremely helpful side handles for simple and quick transport. It also features foldable outfeed and infeed tables for convenience. This wood planer utilizes a tri-roller feeding system that helps to prevent snipe. It also comes with reversible dual blades for longevity. A dust hose port is built into the planer’s side. This provides the option for extracting dust via a wet or dry vacuum without blowing dust around your workplace. 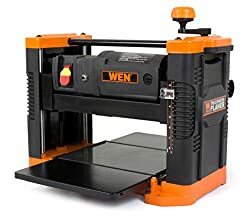 Unfortunately, the WEN 6550 Planer is not the most durable wood planer on our list. Typically, this product has a lifespan average of less than a year or so. This may be due to the cheaply designed base and carrier plates that tend to crack fairly quickly. The WEN 6550 Planer comes with multiple additional attachments. These include the foldable infeed and outfeed tables, the fan assisted dust port, a roller bar, and the side handles. It also comes with a 2-year warranty that protects against product defects in materials and workmanship. It’s definitely a product that’s worth its price. If the WEN 6550 Planer had a better lifespan average, then it definitely would have ranked higher on our list. The Makita 2012NB Planer comes up next on our list with its sturdy 4-post design. It also features a diagonal cross section for better support and stability while in use. This planer features a low 83dB noise level for comfort. However, you may still want to wear hearing protection while using this planer. It comes with a 15 amp motor that has a speed of 8,500 RPM. Equipped with large table extensions, it’s perfect for working with larger materials. In fact, it can hold boards of wood up to 6- 3/32” thick and 12” wide. The Makita 2012NB Planer utilizes disposable double-edge blades for convenience. It also comes with a handy LED light that indicates when the planer is plugged in and is ready to be used. The on/off switch is actually a large foot paddle for safer and easier operation. It guarantees fast and simple blade changes for saving you time and effort. This planer is also designed with an Interna-Lok automated head clamp which is perfect for preventing or minimalizing snipe. There’s really not much we can say about this planer in terms of problems or negative issues. However, I will point out that when using the Makita 2012NB Planer, you’ll want to be hyper aware of tear-out. I’m not sure if it’s because the blades are dull or that they were inserted wrong. I recommend checking the blades before using the planer. The Makita 2012NB Planer comes with a complementary blade set, wrenches, magnetic holders, and a tool box. It also comes with both a 30-day money back guarantee and a 3-year warranty. The warranty protects against product defects in materials and workmanship. The Makita 2012NB Planer may not be the easiest planer on our list to use. That’s why we’d recommend it for more experienced woodworkers. The Makita 2012NB Planer was an extremely impressive product that we felt would work well for an experienced woodworker. The PORTER-CABLE PC60THP features a 6 amp motor with a max RPM of 16,500. It utilizes 2 dust extraction ports on both sides of the planer. This keeps the machine from malfunctioning and prevents the buildup of dust and dirt in your workplace. It comes equipped with an over-mold depth knob that provides exceptional control via its 10 positive steps and pre-set settings. This planer comes designed with 3 chamfering grooves for a handy chamfering option. It also features an 11.5” shoe made of aluminum which provides better control and results. The PORTER-CABLE PC60THP comes with a few additional accessories and attachments. These include the carbide cutting blades, a dust bag, a wrench, an edge guide, and a kit bag. At 8.8 pounds, it’s a lightweight, portable option for a planer. While it might not stand up to heavy-duty industrial work, it makes a great option for a personal planer. Not only that, but it’s one of the cheapest options on our list. Despite the PORTER-CABLE PC60THP’s low cost, it’s a surprisingly sturdy product. Because it is fairly small, it’s not the best for heavy-duty work. This is clearly seen due to the small and less sturdy dust bag. The dust bag may easily rip or fall off mid-use. Despite this, the planer is still a worthwhile product. The PORTER-CABLE PC60THP is an extremely affordable option for a planer. Lightweight and compact, it’s also easy to maneuver and maintain. This product comes with a 3-year warranty that protects against product defects in materials and workmanship. If you’re looking for a simple portable wood planer, the PORTER-CABLE PC60THP is a great option. 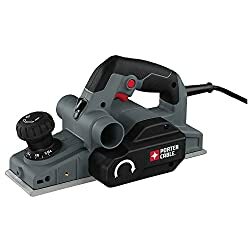 There’s nothing particularly special about the PORTER-CABLE PC60THP besides that it would make a great option for less experienced woodworkers. The Makita KP0810 Planer features a 7.5 amp motor that’s capable of reaching up to 16,000 RPM. This is due to its extremely powerful 2-blade cutter head which allows for quick stock removal with smooth results. Equipped with dual-edge carbide blades, it cut at most 3-1/4” wide and 5/32” deep boards. It comes with both a lock-on and lock-off button which is located on the planer’s handle. The lock-on button allows for continuous use without extra effort. Meanwhile, the lock-off button prevents the planer from suddenly or accidently starting when not in use. It also features a large ergonomic rubberized grip for comfort and easy maneuverability. The Makita KP0810 Planer comes with a sturdy die-cast aluminum house for increased durability. Its spring loaded kickstand helps to protect the blades and piece while providing a stable environment. This planer features a chip ejection port on both sides of the product. The port utilizes a built-in fan for actively and powerfully ejecting dust and woodchips from the planer, mid-use. To be honest, the only negative thing we have to say about the Makita KP0810 Planer is that it’s loud. I definitely recommend you purchase some hearing protection before plugging in this planer. The Makita KP0810 Planer comes with a blade gauge assembly, a blade set, a wrench, a guide rule, and a depth guide. It also comes with a handy 1-year warranty that protects against product defects in materials and workmanship. While it’s not the cheapest planer on our list, it’s not outrageously expensive. It can handle both heavy-duty and light work easily while requiring very little care and maintenance. We were really impressed with the Makita KP0810 Planer. I’d recommend it for anyone. The Grizzly G0505 Planer features a 2 HP motor that’s capable of performing up to 10,000 RPM. Equipped to hand a cutting width of 12-1/2”, it has a max cutting height of 6” with a max depth of 3/32”. Due to its 1/8” thick blades, its cutting average is roughly 52 passes per inch. It features a handy on/off safety lock toggle switch for preventing accidental or sudden starts when not in use. This planer also comes with a pair of top mounted return rollers. The Grizzly G0505 Planer comes with a built-in thermal overload protection device. This prevents your planer from overheating and suddenly shutting off mid-use. A knife setting jig and a wrench come included with the planer. It also comes with a handy deflector shield for keeping dust and woodchips out of your eyes. You can purchase a dust adapter separately to pair with a vac system. Overall, this planer is an incredibly well-made product. Featuring a sturdy and stable design, it’ll provide years of snipe-free results. I’d say that the most frustrating thing about the Grizzly G0505 Planer is the blades. The blades are designed without holes which are meant to control depth consistency. This sometimes causes inconsistent heights. Also, removing the blades can be extremely frustrating. Unfortunately, the Grizzly G0505 Planer doesn’t come with a product warranty or money back guarantee. At 78 pounds, it’s a bit heavy, making it less portable than the manufacturer claims. However, it’s a very easy planer to use. Even a novice or new woodworker could navigate its large and impressive design. Not only that, but it handles heavy-duty work like an industrial-quality machine. It’s a great option for a professional or novice woodworker. The Grizzly G0505 Planer featured a sturdy and powerful design. Unfortunately, that’s all it had going for it. The Bosch PL2632K Planer comes with a 6.5 amp motor that’s capable of reaching up to 16,500 RPM. Like other Bosch products, it features both a lock-on and lock-off button. The lock-on button is helpful for continuous cutting with little extra effort. Meanwhile, the lock-off button prevents sudden and accidental starts while not in use. It comes equipped with a spring-loaded stand for elevating the tool, protecting the blades, and providing a solid, sturdy workplace. This planer also comes with front and rear aluminum shoes to ensure accuracy. The Bosch PL2632K Planer features a handy 2-blade system for quick stock removal with smooth results. Dust ports are built into the planers sides for removing dust, dirt, and woodchips. Meanwhile, this product comes with a non-flexing fence for guidance. This works well at preventing marring and scratching of the workpieces. Finally, the Bosch PL2632K is equipped to hold both re-sharpenable and high-speed steel blades. 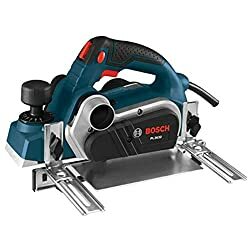 The Bosch PL2632K Planer works extremely well. However, its aluminum surface tends to heat up extremely quickly and the plates sometimes break and crack. These are just a few things you might want to look out for if you purchase this planer. The Bosch PL2632K Planer comes with quite a few additional items. These include a wrench, a dual-mount fence, and a carrying case. You’re also provided with complementary blades, 2 no-mar overshoes, and a shaving bag for the debris. Unfortunately, it does not come with a product warranty or money back guarantee. Otherwise, it comes with the all-inclusive planer kit that Bosch seems to specialize in. 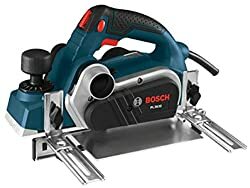 The Bosch PL2632K Planer performs as well as any other Bosch product. Albeit, with a slightly weaker motor. The JET 708457DXK JJ-6CSDX Planer features the most unique design out of all the planers on our list. Built with a “T”-like design, its features an extra-long table which guarantees exceptional control and accuracy. It comes with 1 HP motor that’s capable of reaching up to 6000 RPM. Its impressive 3 high-speed steel knives are perfect for super rapid cutting with smooth results. The planer also comes with a steel enclosed base cabinet. At the ends of the cabinet’s bottom are integral tabs which are used to secure the jointer. This guarantees a solid and sturdy surface while in use. The JET 708457DXK JJ-6CSDX Planer’s motor utilizes a built-in fan for preventing overheating and sudden malfunctions. Along the table’s front are built-in handwheels that adjust the table’s height. There’s also an automatic limiter built into the infeed table that prevents cuts deeper than 1/8”. Of course, this limiter can also be manually overridden, if need be. Finally, this planer’s double-edged knives are guaranteed a longer lifespan compared to regular blades. It also features a quick and simple knife setting system for easy blade switching or height adjustments. There are 2 downsides to the JET 708457DXK JJ-6CSDX. The first is its price. Costing almost $1,000, it’s the most expensive product on our list. Second, is its weight. At 256 pounds, it’s extremely heavy and difficult to move. Because of these 2 factors, I have to dissuade anyone looking for a portable or user-friendly planer from purchasing this product. It’s definitely a product designed for professional, expert use. The JET 708457DXK JJ-6CSDX comes with a wide range of additional attachments. These include a dust chute for preventing the buildup of dust and woodchips. It also comes with a bed and fence assembly, a cutter guard, a v-belt, ¼” flat washers, and 20 half-inch pan head screws. A carrying case and a 5-year warranty are included, as well. Of course, the 5-year warranty protects against product defects in materials and workmanship. Despite its weight and price, the JET 708457DXK JJ-6CSDX Planer is one of our favorites. The DEWALT DW735 Planer comes with an impressive 15 amp motor that’s capable of up to 20,000 RPM. Equipped with a 3-knife cutterhead, it’s guaranteed to provide a 30 percent longer knife than any common planer. It features a 2-speed gearbox for altering the feed’s speed with a cutting average of 96 CPI to 179 CPI. This product comes with a handy fan-assisted chip ejection port. It prevents the build-up of dust, dirt, and woodchips along the cutter-head. Its automatic carriage lock helps to minimalize snipe by preventing sliding and movement. The DEWALT DW735 Planer features 19-3/4” infeed and outfeed tables for a wide range of uses. It’s equipped with an extra-large thickness scale and material removal gauge for extremely precise cuts. This planer also features a turret depth stop for convenience. Included with the DEWALT DW735 Planer is a complementary set of knives. Overall, this planer is extremely easy to use and maneuver. It’s a great option for new carpenter still learning the basics of woodworking. There have been quite a few complaints about the DEWALT DW735 Planer in terms of its lifespan and durability. Many reviews complain about the planer not turning on again after 4-6 months of use. A few commented that the knife assembly is poorly designed. It really just seems like this planer utilizes poorly manufactured products that require more care and maintenance to keep the planer running. For those who are interested, it’s important to note that the DEWALT DW735 Planer comes with a dust ejector port. It takes both 2.5” and 4”, but the 4” tends to work better. This planer also comes with a 3-year limited warranty that protects against product defects in materials and workmanship. While this tool is a bit pricey and heavy, it’s very easy to navigate and it is very user-friendly. Because of this, I’d say that it’s a good choice for a first-time buyer. 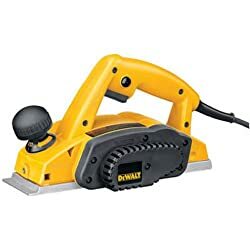 If the DEWALT DW735 Planer was built with more resilient materials, it would be a great industrial-quality alternative for a planer. 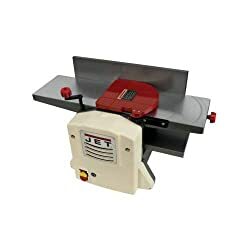 The Jet JJP-8BT Planer features the same unique “T” shape as the JET 708457DXK JJ-6CSDX. Albeit, on a slightly smaller and cheaper scale. Equipped with a 12 amp motor, this tool is capable of reaching up to 18,000 RPM, easily. It comes with an oversized ergonomic adjustment knob to controlling the height of the planer. This product features a 2-in-1 design which includes a benchtop jointer and a planer, all in the same product. It utilizes 2 high-speed steel blades for quick and efficient stock removal with smooth results. The Jet JJP-8BT Planer comes with an aluminum fence that’s capable of reaching up to a 45-degree angle. This product is extremely easy to navigate and control with its user-friendly design. It’s a small planer that’s perfect for both personal and professional level use. At 68 pounds, it’s not only portable but also easy to maneuver. It’s also much cheaper than the JET 708457DXK JJ-6CSDX. The biggest problem with the Jet JJP-8BT Planer is the alignment of the infeed and outfeed table. I think it may have something to do with the jointer, but whenever I use the jointer the tables lose height. Maybe by around ¼ of an inch. I’d say that the 2-in-1 design doesn’t work perfectly. The Jet JJP-8BT Planer comes with the 2-in-1 product which consists of the planer and the jointer. It also comes with a 3-year limited warranty that protects against product defects in materials and workmanship. This planer is the perfect option for anyone who was impressed by its predecessor, the JET 708457DXK JJ-6CSDX but dissuaded by its price. 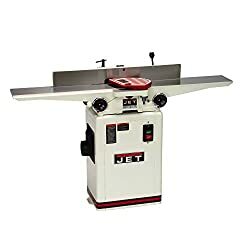 The Jet JJP-8BT Planer is not only smaller than the other Jet planer but also cheaper and easier to maneuver. It’s the perfect alternative. The last planer on our list is the DEWALT DW734 Benchtop Planer. Equipped with a 15 amp motor, it’s guaranteed to perform up to 20,000 RPM. Equipped with a 3-knife cutterhead, it can deliver roughly 96 cuts per inch. It comes with handy double-edged knives that tend to have more at least 30 percent more knife life than any common blade. It’s also designed with a 4-column carriage design for a sturdier and more stable work area with less snipe. The DEWALT DW734 Benchtop Planer comes equipped with 33-1/2” infeed and outfeed tables. This allows it to hold and support extra-long materials, as well as, small materials. It features a maximum cutting depth of 1/8” with a 6” depth capacity and a 12 ½” width capacity. This planer utilizes a dust hood for preventing dust and woodchip build-up. You simply attach it to your shop vac when you’re ready to use it. There’s not much to say for the DEWALT DW734 Benchtop Planer. The blades tend to dull extremely quickly and you should definitely look out for snipe. Otherwise, it works as advertised. The DEWALT DW734 Benchtop Planer comes with a 3-knife cutterhead and a handy dust hood. It also comes with a 3-year limited warranty against product defects in materials and workmanship. Along with the warranty, you’re guaranteed a 90-day money back guarantee and a 1-year free customer service guarantee. The DEWALT DW734 Benchtop Planer is one of our top favorite picks. When purchasing a reliable planer, it’s important that you know the basics about the machine. That’s why we’ve included a helpful buyer’s guide to answer all your planer related questions. Why don’t you take a look at what we’ve composed? What is a planer tool? A wood planer, or thickness planer, is a large woodworking tool that’s used to trim wood boards. This creates a consistent thickness throughout the board, as well as, a smooth, flat surface. The wood board is then used for a variety of other carpentry projects. So, simply, a planer preps wood boards for woodworking projects. How does an electric planer work? Typically hand planers are used to remove stock or wood. However, electric planers alleviate the need for muscle power. Instead, electric planers use cutterheads, a set of sharp knives or blades, to mechanically remove stock. It’s a much easier process. However, it’s very easy to make a mistake and basically prevents detail work. What are the different types of planers? As stated before, handheld planers require muscle work to remove stock. They’re small, portable, and are extremely easy to use. It’s basically a tool with a sharp blade to forcefully remove wood from boards. The blade glides over the wood’s surface, like a razor blade, until its smooth. It’s the best option for detail work in that you’re provided a lot of control. This planer is also much cheaper than most other planers. The term thickness planer is just another name for a planer machine. It’s a common term in the UK and Australia. This planer uses cutterheads to smooth and even out boards on both sides. It uses feed rollers to draw planks of wood in and out of the machine. It’s important to note that a jointer tool is not a planer. Typically, a jointer tool is used to smooth warped or bowed boards of wood. Meanwhile, planers are used after jointers level out the board’s thickness. Jointer-planers are combined machinery that simply does both. They’re typically very expensive, very heavy, and not very portable. It’s a good option for any serious or professional carpenter. Most portable planers are simply small, compact planers that are easy to maneuver. They can be electric or hand, but they’re best for small projects. These are too small for larger pieces of materials. Most benchtop planers feature a column design. Some may utilize dual-columns, or 4 columns for more stability. They’re best for larger materials and are less portable. This planer type is more expensive than portable or handheld planers. However, they can also be more durable. What to look for in a wood planer? It’s important to make your decision based on the type of project you have in mind. If you have a small project with small boards, then a handheld or portable planer will work fine. On the other hand, if you’re a professional or plan to have both small and large projects, then a benchtop or a jointer-planer would be best. Professionals should definitely invest in a jointer-planer as there will be times that you’ll need to correct warped boards. There are 2 types of planer motors: Induction and Universal. The induction type motor is common in benchtop or jointer-planers. This is because induction type motor is typically more powerful and it is best for long, heavy-duty projects. The Universal motor is inexpensive and lightweight, making it a preferable option for portable planers. They’re best for smaller, easier projects. Your budget and project needs will determine which motor is best. It’s important to determine how much available workspace you have to work with. If you purchase a jointer or benchtop planer, you’ll need enough space to store it. Regardless of rather it’s a benchtop planer or a handheld planer you’ll need a stable sturdy table to work on. Some planers, such as the JET 708457DXK JJ-6CSDX, come with their own cabinets and workspace. If that’s the case, then all you need is to make room in your workshop. It’s important to consider how much stock you’ll have to remove. If you have a lot of work to do, then you’ll need a powerful motor. This means you’ll be looking at an induction motor in a jointer-planer or a benchtop planer. Again, this applies for those who plan to go into carpentry as a profession. However, if you have a little bit of stock to remove, you can settle on a handheld or portable planer. This basically means how quickly the planer performs per inch or per second. The stroke count is determined based on the number of blades, the motor, and speed of the rotating blades. It only applies to electric planers. If you’re a professional carpenter, then you’ll want a higher stroke count or a planer with a variable speed option. This will help you work quickly and efficiently. Jointer- Planer vs. Thickness Planer: Which is the Best? That’s a difficult question to answer. I’d have to say the jointer-planer is much more useful in that it not only alleviates thickness but also fixes warped, twisted boards. How do you use a benchtop planer correctly? Using a benchtop planer is extremely easy. Avoid tearouts: To avoid tearouts, you’ll want to insert the board into the planer going with the grain. This will provide nice, smooth results. Rid saw marks: To get rid of irritating saw marks, just gang feed the spindle into the planer. This will also help minimize snipe. Reduce Snipe: Snipe is an uneven thickness at the beginning or end of the board. This is common with all planers and it’s pretty much unavoidable. The only way to reduce this is to use an extra, unnecessary board first and then insert the actual board right after it. You could also use an extra-long board that has an additional 5”. Simply cut off the snipe afterward. Hopefully, this in-depth review of the top-selling benchtop planers has been a helpful source of information. Despite what our final verdicts might state, the decision to purchase one of our choices is entirely up to you. Rest assured that each of our top choices can perform impressively to accomplish your woodworking goals. Not all of these machines may be worth the cost or have an exceptional life span. However, you’re guaranteed to not be disappointed with what you purchase. Each of our choices is definitely a good planer to own. Overall, I hope you’ve enjoyed our review. If you have any comments or questions, I encourage you to write us back. What did you enjoy or disagree with in our article? Do you currently or previously own one of our planer choices? If so, then how did it perform? Would you recommend it to a friend? 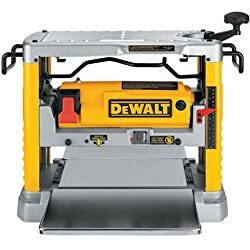 Which product do you think is the best woodworking planer of 2019?